The World amateur radio day. Home made tracking generator for spectr.analyzer HP8561. Cheap plasma cutter. Prefinal results of March Contest for last check. Hovewer: where are DL and other logs for verification? Missing? New 2m beacon in Poland: SP9KFZ from JO90NS. Presentation: EME project SM4GGC. More. Bigger is better. First 70cm QSO OK - VP2E. Congrats! Low noise linear stabilizer. More, than 20 years old, but still valid article. Oficial final international results of the UHF& SHF Contest IARU 2018. We are very pleased by our good results. Updated table of Sun noise measurements of well known EME stations for 70cm & above. Meteo radar Skalka. First 23cm QSO OK - VP2 worked OK1KIR. 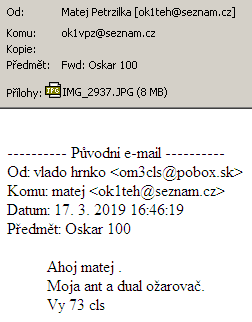 Quadrantids 2019 - delayed reports: OK1TEH, OK2PMS, OM5CM. First 2m QSO OK - VP2E! Do you know ww.antenna.su? Patch feed 7N1JVW for 2,4 GHz. Compare. UA1LO? First 6cm QSO OK - LY! Web hamradio.sk celebrates 20 years of activity. Congrats! Fan controller for your PA.
Breakthrough observation -> 1st direct image of near area around black hole M87. How to detect M87 on 74cm. Good news for us: we believe finally completed results of the IARU international evaluation of UHF/SHF Contest. Next weekend will be held 23cm leg of DUBUS EME Contest! 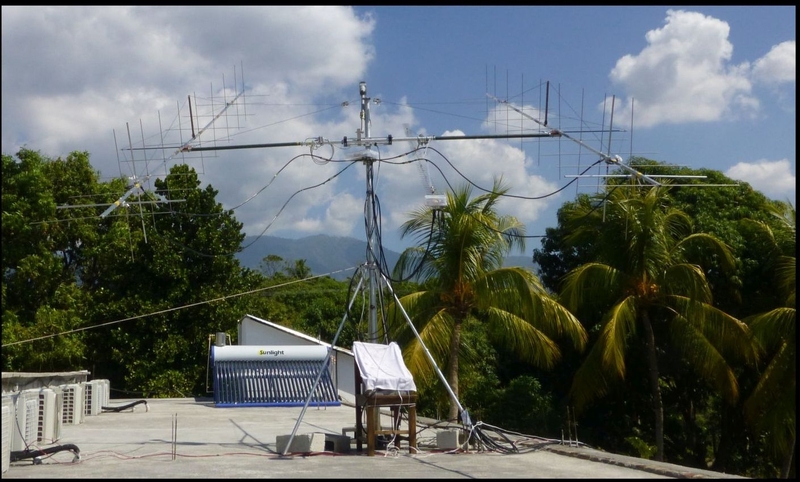 New EME Newsletter K2UYH for UHF/SHF. Note. Sun activity forecast for next 11 years period. GaN transistor for 23cm PA. WIFI ISPs night mare. MW&RF web. Spring DARC VHF activity. At least give them few points! How to manage fast expansion of many digital modes? 23cm DUBUS/REF EME Contest: already this weekend! TS890 has 4m - video. CMPA801B025F: 37W at 3cm. Interesting chips: programmable controlled GHz attenuators. GHz trip to LY. EMC issue by DL NRA. ADF4371. Where to buy power supply connectors for YAESU? Uplink trv for EsHail2. 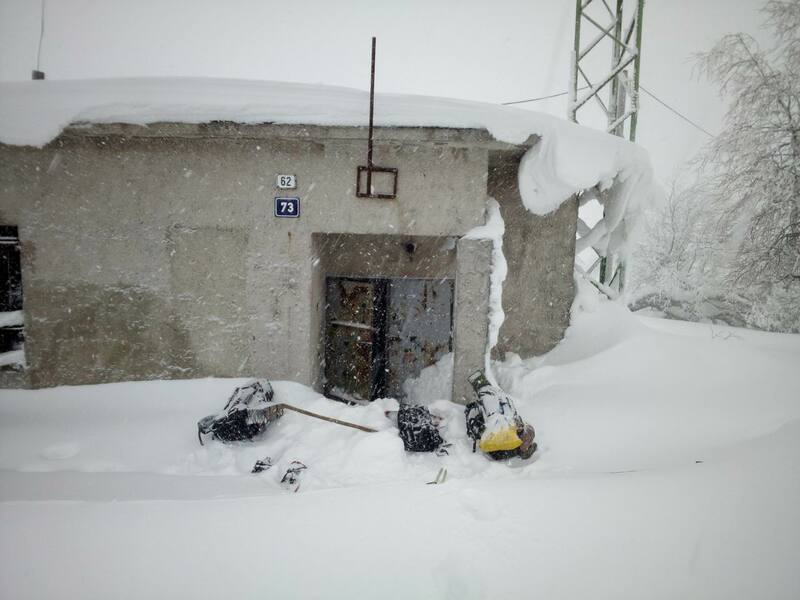 VHF activity story of West.Ukraine. Be ready for VP2EMB DX-trip on ordinary bands. Video. DK7ZB: Delta loop antenna for low bands. PWR tubes. Discussion about draft of the new ham radio rules. Well known OM, pioneer of cm bands OK1VMK is SK. RIP! The best 50MHz antennas. Statistics of VHF C-test. Archive searching brings success. 10 + 24 GHz on Siberia. Oficial final IARU R1 VHF Contest 2018 international results. Did you seen this? 4U1UN activation on 144MHz? Some inspiration. Nice gift. And if you already have EME dish? W6PQL paper abt. last development of SSPAs. TO2MB DX-pedition has finished, results here. In April would be active VP2EMB. LO for sat LNB. OK1AKJ SK. LNA suggestion by OK1GTH. Short note. 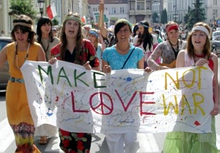 Italian "activity contest" has been held parallel with Scandinavian NAC. Marconi Memorial Contest final international results list. Contest report OK1TEH added. EME news OK2PMS. OK1EM: his EME construction effort gallery. Some probability of Aurora. Old screened bannana plug + socket. March VHF Contest: OK1TEH and OL3Y. 70MHz beacon SR8FL. PA1A: much higher mast, than has expected. First QSO OK - TO on 23cm agn by OK1KIR. Congrats! EME milivoltmeter. More here. Kick out them from VHF. 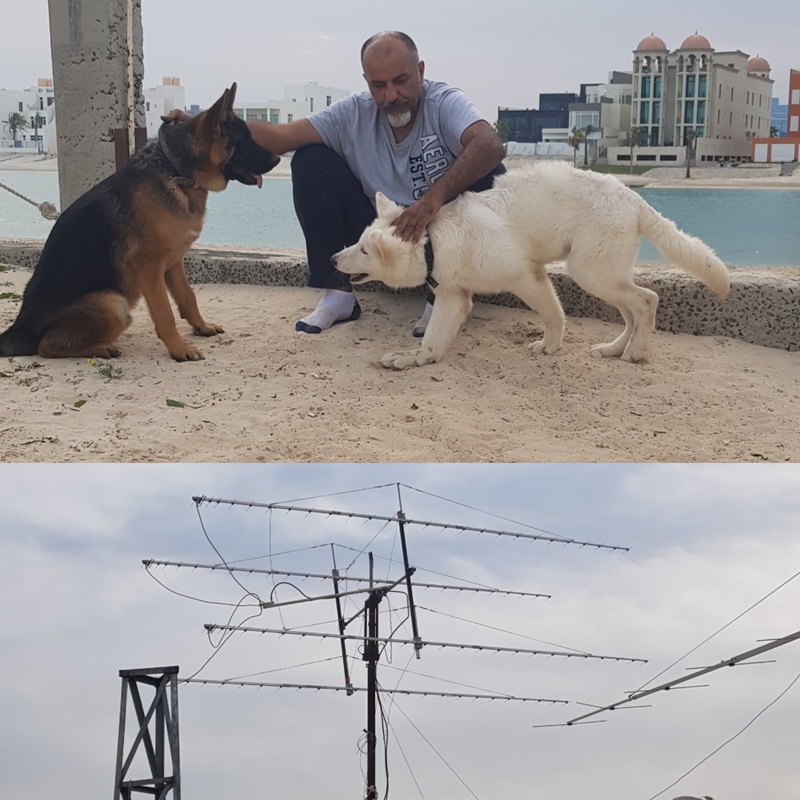 March VHF Contest: I1KFH and IQ8XF. First 70cm QSO OK - TO assigned to OK1KIR. DC load by OK1UGA. 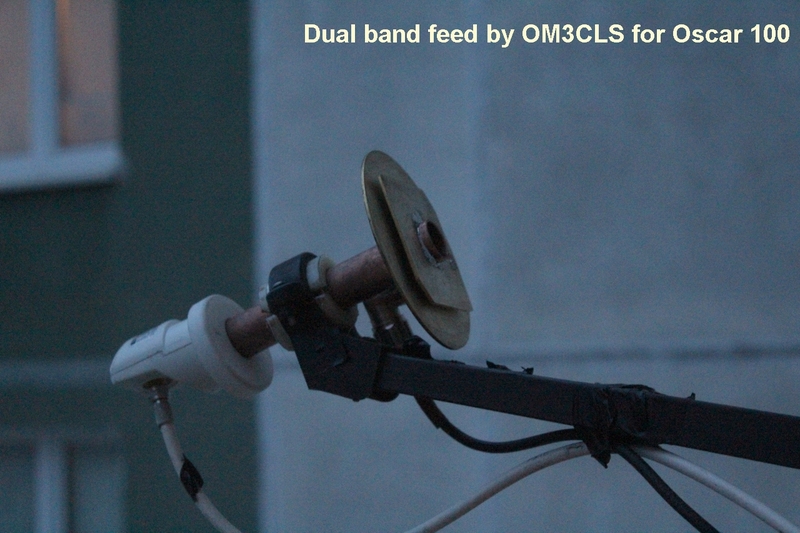 Dual feed by OM3CLS for Oscar 100 utlize 13cm patch antenna. More. Well known David GM4JJJ passed away. Good opportunity worked Ceuta on 2m (EF9LZ). Valuing of UK ham radio spectrum use. Precise signal on UHF. K2UYH released new EME NewsLetter for UHF + SHF bands. MRF13750H is for 275 €. Why exactly 50 Ohms? March VHF Contest: OK5T, DM7A. Actual IARU beacons list. Video of the DX record RS QSO at 3cm. 1127km! March VHF Contest: OK4AC, OM4C, OM3KSI. OK1DST via Oscar 100. Attenuation calculator of usual cables. DX record QSOs on 24GHz in Australia. Update of DX records, results + awards lists. March Contest by OM3KII. Helix antenna OM7AQ as a feed for Oscar 100 uplink. Don't forget send a March contest log to IARU evaluation. Uplink TX for Oscar 100: for 25 € only. Antenna feed OM6AA (A75GR) for Oscar 100. March C-test by OM3KTR. March VHF Contest: OK5K, PH4X, OL4N (+), PI4GN, OK1UFF + DF0TEC. Magnetic North is on the fast move. March VHF Contest: OK1NPF, OK1OPT, OK1VM, ON4KHG, DR2X, F6KFH, HA5KDQ, HA6W, S59P, 9A4QV. International results of IARU R1 UHF/SHF Contest 2018 for final check. Some OK logs sent (?) by CRC are lost. March VHF Contest by: OK1KFH, OK1KUO, OL4K, OK2C. Claimed results in: 9A, S5, OK, OM, PA, UK + Eu. March VHF Contest: OL2J, DF0TEC, IQ1KW. OK1RW's 9cm transverter. TI2AEB became SK. Oscar-100 RX II. Review of "no name" signal generator from e-bay. Funny mystery of spy TV series. Local oscillator on request. VP2EMB QSP. Let us to know. March contest weather forecast. Worldwide survey of amateur radio community. Combined antenna patch feed for communication via Oscar 100 satellite. SR6VHF 70cm beacon is temp. QRT. 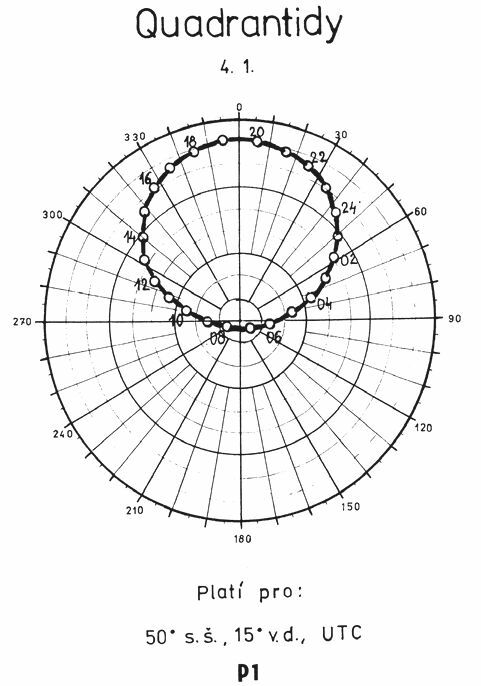 Geometric model of the parabolic dish in CAD SW. CRC managed 50MHz interference. 60m news. TF on 16cm. Current EME NewsLetter K2UYH for 70cm and higher bands. 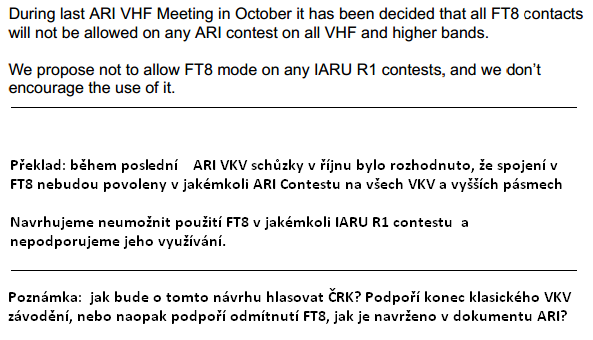 Will IARU supports use of FT8 in VHF Contesting? In March will be EA9 on 2m. During May check on 2m QRV KH0 from QK25. OK1DIX wrote abt.DUBUS C-test. Leave your announce about contest activity in the March IARU Contest. FTDX101d works as well as at 70MHz. We have register already more, than 4 milions visitors. Tnx! Satellite receiver for EsHail transponder for 8€ only. Reasonable price of 23cm driver transistor. Usable tips & tricks. On the IARU web are prefinal results of VHF-C.
Dokuments for Vienna IARU meeting of VHF Commitee (C5). Nothing by CRC. Discussion to C-test evaluation. 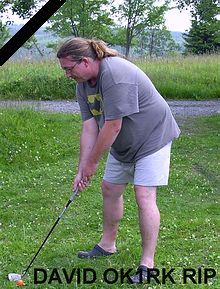 DL6WU, antenna designs expert, passed away. RIP! New OK beacon: OK0SIX. 13cm WIFI PA isn't for WIFI. This weekend observe tropo condx. Japanese SPSUs. G4CQM antennas. OM0MUC beacon is temporary QRT. All delayed contest logs were processed, so the preliminary list of Marconi memorial Contest is available again. New 144MHz EME NewsLetter DF2ZC. G4DDK and his HW for Oscar 100. Useful info + SW for download here. Transceivers by Kenwood were often consider as "user friendly". How well will go their new ship TS890 at VHF? Web pages G4ZTR and his article abt. Air plane Scatter operation. HF activity, which will not help to anything. Microwave web page G8CUB. Burned N type connector: but why? Bulgarian xverter + 20W PA. 76GHz and up. 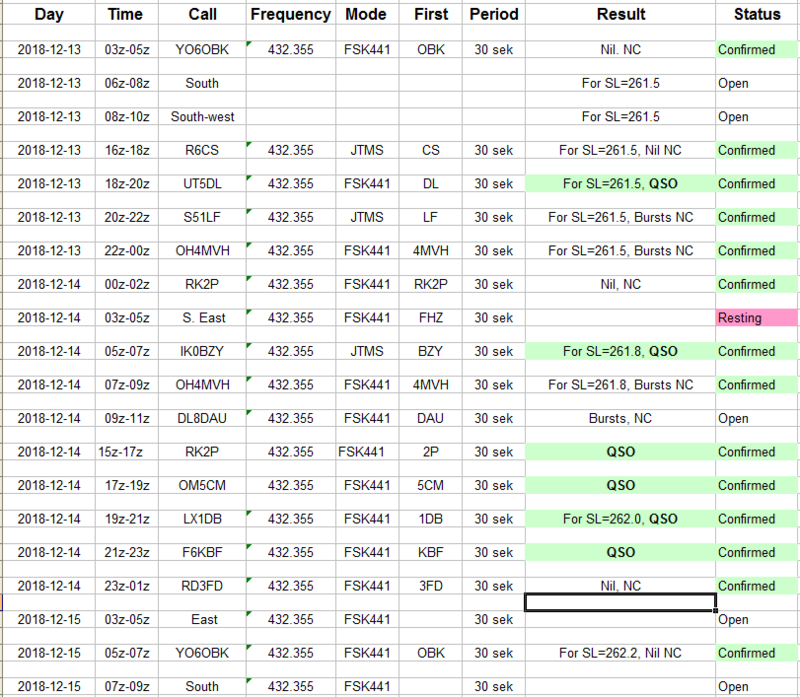 Results of completed OK evaluation of the IARU UHF/SHF C-test. DX-record: 10GHz beacon in 1281km QRB! Just now is held CW/SSB DUBUS EME Contest. Share points. EME-pedition VP2EMB has planned for April. 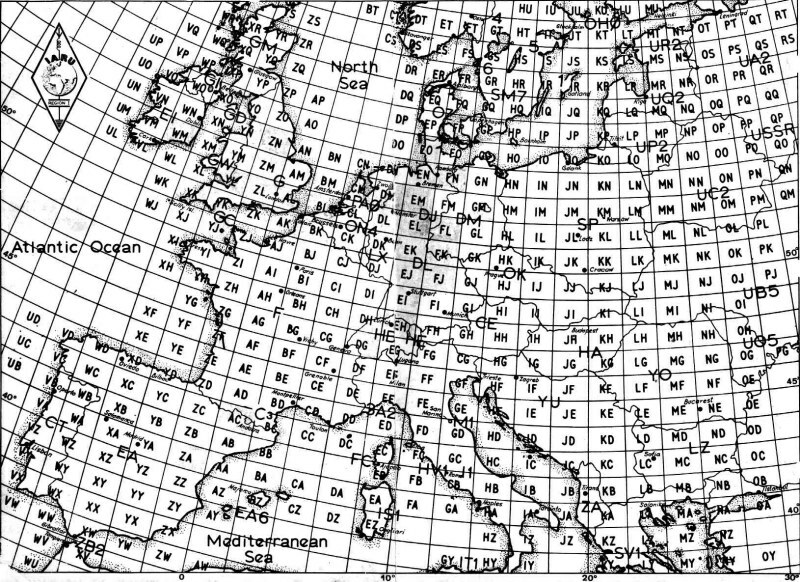 Try to use tropo condx forecast. This Saturday. DK7ZB published in Funkamateur analysis of OK1DE antenna. 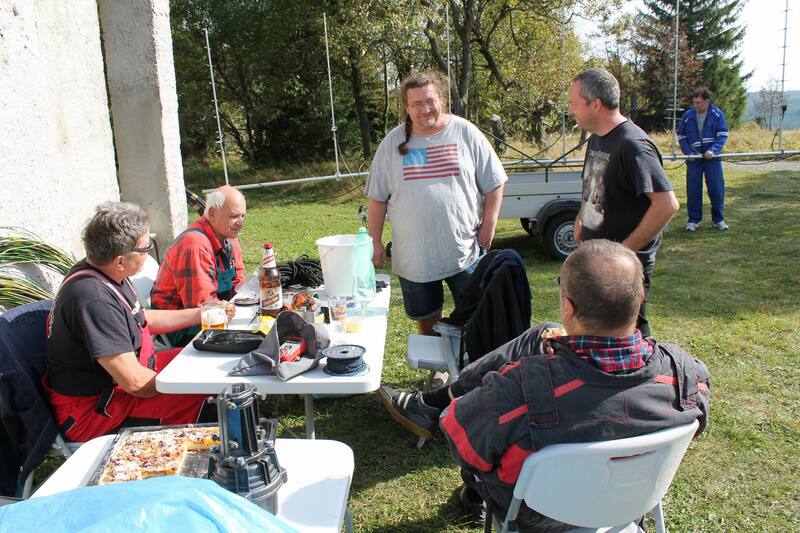 Jacques ON4AVJ chairman of VHF Commitee C5 IARU R1 put the resignation. Maybe opportunity for OK1RI? International results of the Marconi Memorial Contest. ES-Hail sat 13/3cm geostacionary transponder is QRV. Geostacionary satellite with amateur radio transponder on board would be QRV since 14.2. Suggested reading. 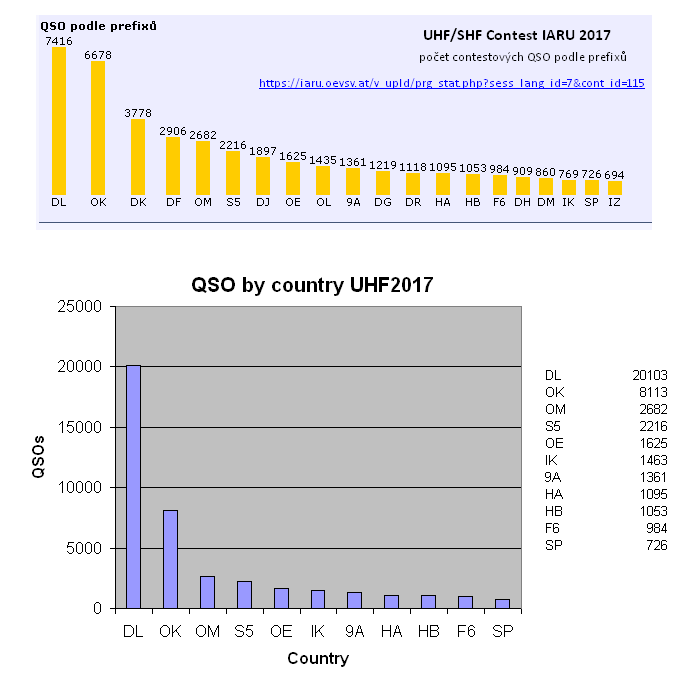 European results of the IARU VHF Contest 2018. 50/70MHz IARU Contest results. 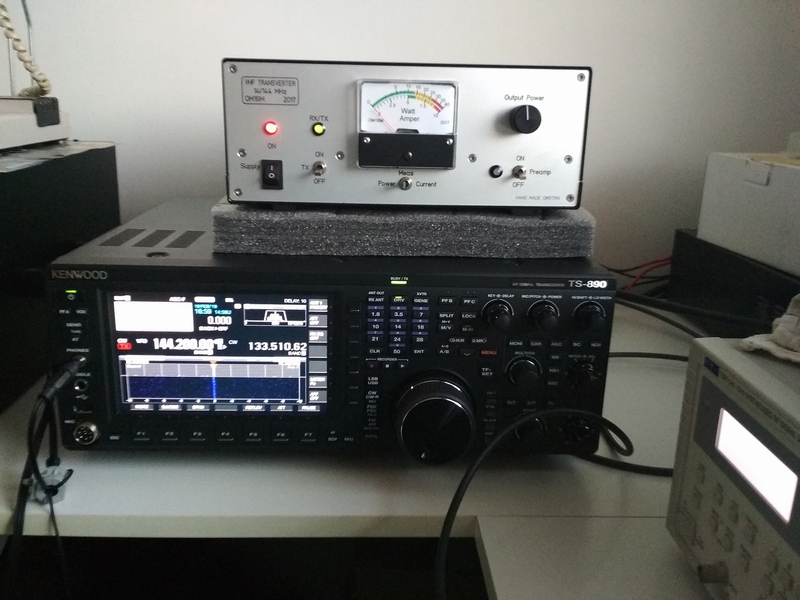 New 23cm PAs by DK2FD. Atypical fault of PA BEKO HLV1000. Observe probability of tropo condx. Do you know web of UHF SATCOM? K2UYH released new EME Newsletter for 70cm & UP. Winter QRP contest by: OK1MWW and OL120AB + 2. 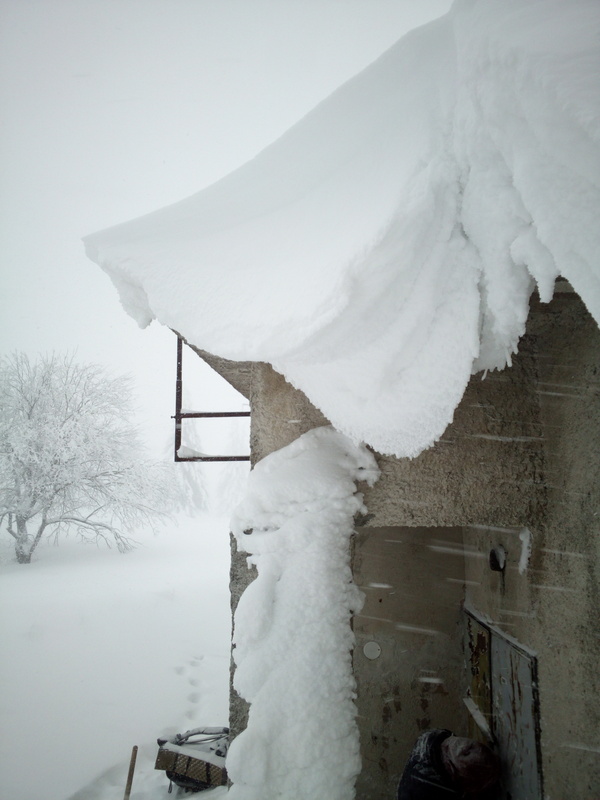 Ore Mountains (OK1KSO QTH) in January. Visitation of OK2KKW's QTH on 3.2. Results of ARI EME Contest. Wrong video links in our contests reports were fixed. 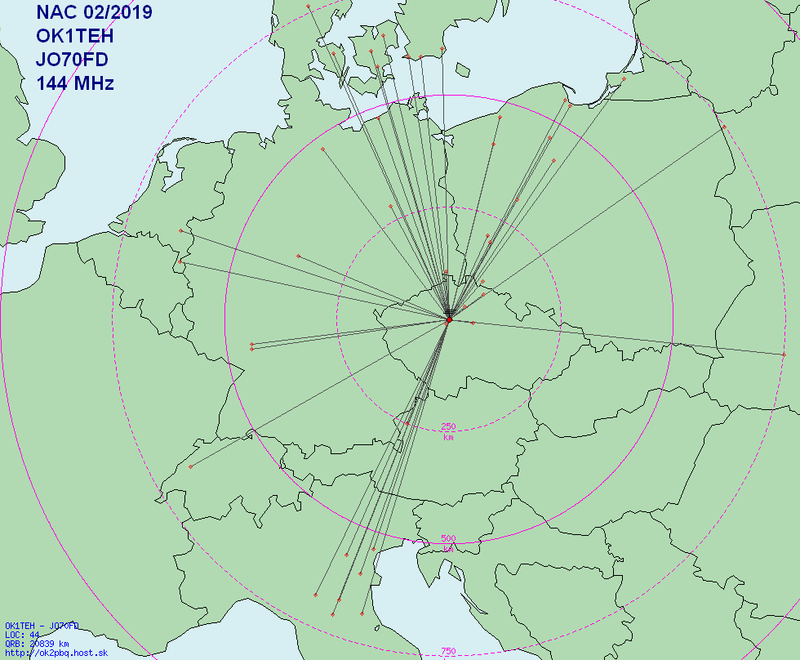 144MHz tropo QSOs from Prague on 5th.February 2019. OK Winter QRP Contest: OK1FEN, OK1KUR, OK1VOF. 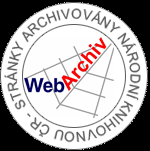 Beta version: new web page of ČAV. May it help you? Good to see: MIT Haystack Observatory. More. EME operation needs stable frequency: OK1UFC fast solution. OK1TEH rebirthed memorable call OK1AB. 1.geostacionary hamradio transponder ready to launch. µW video. On 2nd February has held 70cm Contest Romagna and BBT on SHF. On 2m MS was active UT1FG/MM IN67. On 1st February we can expect possible 2m Aurora opening. In August we can look forward to CY9C on 6/2m. ARRL released final results of the ARRL EME Contest 2018, note great success of OK stations at top places. Different tools for AL constructions. 76GHz by UA3AVR. Video of EA3HMJ. Equipment for Es'Hail. GHz news. History of microwave deep space communication. Constructions on KE5FX page. On-line calc of heatsink data. Producer of heatsinks for SSPAs has CZ web as well. Well-known ES1CW died. When compare, we are OK.
And what prepares CRC in order to Czech rep.support on WRC19? Will be it again zero defense of µW bands? MMC 2018 results: DL, F, OM, IK, ON, PA, G. OK1DOM sent an invitation into OK Winter QRP contest. More. Pictures of Lunar eclipse in JO70EC on Jan.21. How to "retune" circulators? Waveguide adapters + coax.relay. Preparation of VHF DX-pedition Botswana. Check out Scatterpoint magazine 2017. FB Movie from: EME 1994. Video found: OK1RK in the UHF Contest 2018. For water cooling SSPA? Annual rental fee of OK0EP has paid. OK1KIR wkd the first 70cm QSO OK - 9K2. Congrats! 2019 SSB EME Funtest: ON5GS, OK2DL & OK2ULQ. 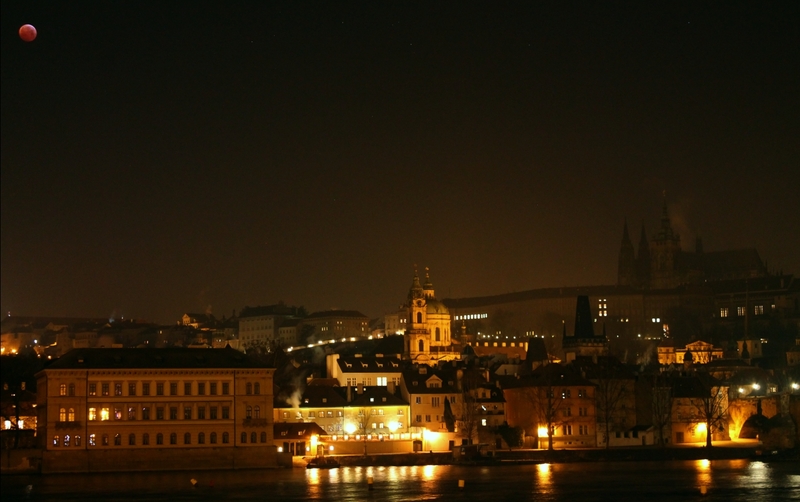 Presentations from EUCARA 2018 meeting (remote DL0SHF, PI9CAM SDR, MS research, pulsars and more). French results of M.M.C. 2018. Change of 13cm bandplan in OZ. New 5P5T's presentation about VHF-C 2018. Yes, it's true. Bad news, which hurts all of us: David is SK. More info soon. OZ7IGY on 13cm is QRT for years. Funny: re-evaluated prefinal results of UHF C-test on CRC web :-) - it mean: you have 7 days agn for comments. Graphic overview of MS efficiency of 2018 meteoritic showers. French microwave bulletins "Hyper" for download. OK1IA released results of OK Christmas Contest 2018. When usual MS reflections debries aren't big enough? Results of OK MMC Contest (A1 Contest) and few asks. Preparation of shocking message. Icom self-applause. Invitation to Slovenian meeting + prize ceremony of Alpe-Adria VHF - UHF C-test 2018. 35 y.old OK2TU antenna. EME NewsLetter DF2ZC for 2m. 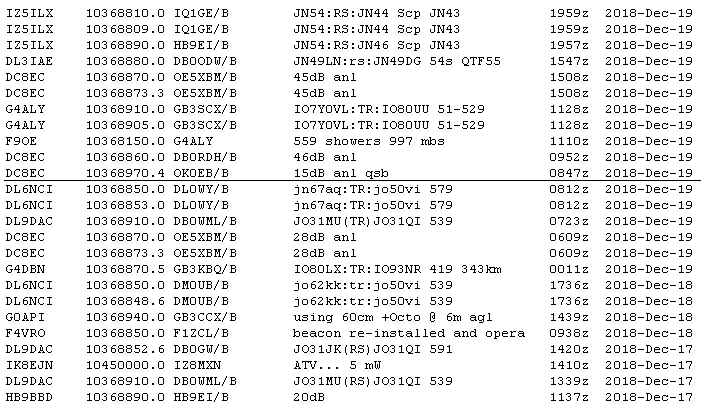 Strange OK results of UHF/SHF Contest - missing cross check with OM logs! Spelling alphabet of more countries by OK1SB. More +. Web page of PA2S. Evolution of locator map: 1, 2 + 3. Remind to leave your vote in the opinion poll of the best 2018 DX-pedition. Dummy load for test of SSPA PSUs. DX trip TO2MB. MS Sprint Contest results. EU duty free list for next period - page.127 - PCB boards materials. Nice presentations focused on EHF dishes for radioastronomy: 1, 2, 3, 4. Murmur SW I0NAA aimed at pulsars. XMAS contest 2018 by: OK1TEH, OK1OPT, OK1KFH, OK1KAD. Map of the most wanted Eu squares on 2m. Rumours has confirmed - planned DX-pedition to Cuba has postponed ad acta. MMC/A1-C 2018 results in OM. Winter Contest Romagna. Spring VHF meetings 1, 2, 3 + 4. News by DG7YBN. Why not to buy it? 6,5 € LNA! Spots of our beacon OK0EP in 37th. year of operation. Interesting link. Compare. Local suggestion. Handbook. How to optimize AADE SW in WINE. Let me know about your MS DXs via Quadrantids 2019. Tr.condx OY-F6. 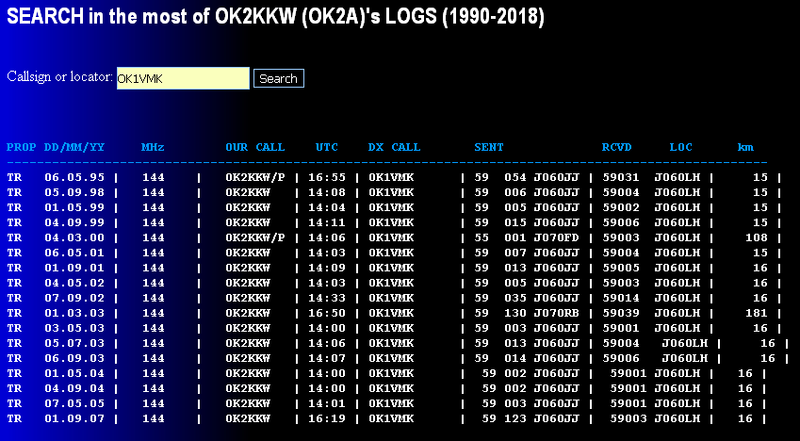 WW locators wkd by OK2A / OK2KKW on VHF mostly in Contests since 1990. Helix feed by G8HAJ for 23cm. Preliminary Czech results of A1 Contest (M.M.C.) 2018. Quadrantids will have maximum on 4th January 2019. On Jan. 1st. on the VHF agn. SBMS Newsletter. EME Vestnik RA4SD. GHz Tagung Dorsten. Scatterpoint 17. CRC publish delayed prefinal results of OK UHF/ SHF Contest 2018. 23cm NAC by ES3RF. Es in December. Geminids 2018 by OK1TEH, OK1UGA, OK2PMS, GM4FVM, SM6FHZ. 40th anniversary of article about EVE. K2UYH releases new EME Newsletter for 70cm &UP already for Jan.19. Testing of AMSAT P4A transponder. Some time ago we asked CHMI and the Czech rain radar map show now as well as ham radio locators, TNX! Final part of HW serial abt.construction of up to date counter: 1, 2, 3. Dish consideration. Stratospheric clouds. Waiting for Quadrantids arrival: opportunity for first 2019 MS DX. More. UHF Contest results in DL, OM, G + IK. Claimed results list of 2m OK Christmas Contest 2018. AMSAT CW activity day will be Jan.1st. Updated links. Where are power limits just formal and why OM6A didn't released report from UHF Contest. EME 4Z5CP. QRP. Last 2018 EME Newsletter DF2ZC for 2 m band. Reception reports of SAQ TX. New pics of NC1I EME system. Another EU locators map for download + print out. Which of 144MHz + 432MHz antennas are currently the best. Already within 3 weeks will be opportunity to make a GHz QSO to Cuba. Remind traditional OK Xmas contest. New project by OK1VM: programmable attenuator. Don't forget to send. New RSGB EU locators map for sale. SHF beacon OK0EB is after long time QRV again. When "national" short wave union is silent. On 70MHz in DL. Czech activity Contest results 2018: we won 23cm. Look back at Summer success. G4DDK's IC9700 thoughts. OMs shall push IARU with short wave managers to defend DX segments of the UHF/SHF bands on WRC2019. LNA for 70cm by OZ1PIF & an additional choke optimalization. How to replace obsolete ATF54143 LNA HEMT. Link to 2017 News. Statistics.